October and March are the demon months in X-Plane. You look forward to them immensely but there is also the dread of the huge workload and the sheer amount of detail that you have to work through. Of course late October is the release month for the Christmas holiday period, and late March is now becoming a very large release period for the Easter holiday period. In fact Easter is now really the most interesting period for X-Plane as users don't have the usual hang ups that usually comes with all the expensive Christmas present giving and worse the "You have to be here to celebrate together" issue... For Easter you have more cash available and more importantly you have far more time for relaxation and X-Plane flying. 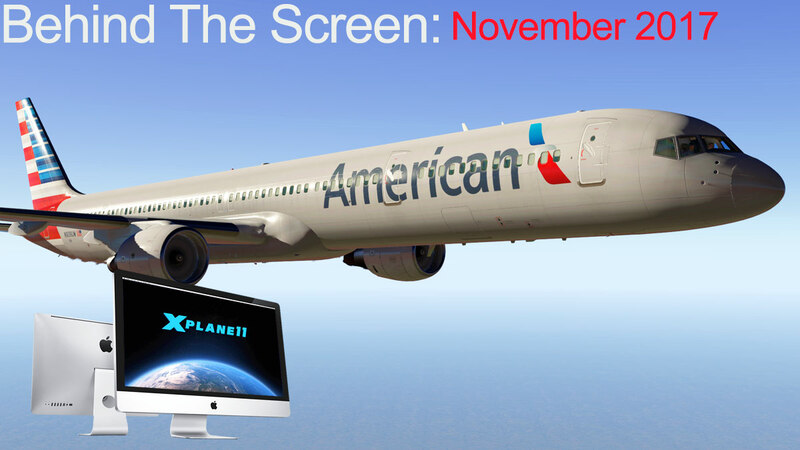 Last year in November 2017 X-Plane was overshadowed by the release of X-Plane11 with the usual Laminar Research thanksgiving present, but this year we won't have that event, and so it is really mostly the usual back to business releases like the final of the release of X-Plane11-10 but there are still a nice load of gifts in this -10 release to keep you well and happy for going into the 2018 New Year. So October 2018 was a blockbuster month with two major releases with the FlightFactor/SteptoSky Airbus A320 Ultimate and the JustFlight/Thranda Arrow III of which I noted in the October edition of "Behind the Screen". Both releases are significant to X-Plane but a lot of users were very annoyed that it was a beta version of the A320 and most were not allowed into the beta process which to date of this edition is still ongoing. On this FF A320U subject I will make one thing very clear and that is the beta process with this aircraft is the one thing you really just don't need in your X-Plane life. Obviously you want to experience the aircraft and devour its incredible features, but... You just don't really want to go there no matter how capable you really think your abilities are. It is a seriously complex aircraft, daunting is a word I will use and very buggy at the point of the beta release and your only return for your initial experience would have been lots of frustration and for the sheer out of your depth feeling on how to fly the aircraft. It is brilliant and it will be one of the foremost experiences in X-Plane by the time of its formal release. So enjoy it then when it is all sorted. On the subject of complex releases is that in November FlightFactor/SteptoSky also released the B757 Professional Extended v3 aircraft. My relationship with the FF/StS B757 has been a bit disconnected in the last year because of a strange password issue that wouldn't unlock the aircraft that even the developer couldn't fix, which means I had very little flying time on this fine aircraft all year. A new version fixed the password issue and I was then a B757 captain again with now three variants to fly with a -300, Freighter and of course the original -200 version. Back in the B757 cockpit I found myself slightly floundering. I knew the aircraft inside out, but did I? It has been over a year since I last reviewed an update on the aircraft and flew it perfectly back then. I soon got my act together but it took three flights before I had become fully accustomed to the aircraft again, once more tuned in then the aircraft came back easily to me and I got the performances that I expected not only from the aircraft but from my own flying abilities. I will make the point that in reality nothing had actually gone wrong, but I simply had lost the feel and flow of flying a complex aircraft, and yes I will admit to this. Like I have mentioned in the past in the ability to "Check" yourself on an aircraft every now and again so you don't lose that flow was certainly brought home hard with this situation. I had been locked out and it showed. There is another point to make on this theory in that it was I think more the underlying changes that was significant than the actual aircraft itself that had changed. Basically the B757 was the same machine, but over the year it had also had improvements, but more so it had been tuned differently for X-Plane11. "ahh" you will say and that is the point. Even though the aircraft was actually the same, in another way it was very different with all the very different aspects of flying now under X-Plane11 dynamics than the other older X-Plane10 parameters. With most aircraft throughout the last year the changes were significant but also subtle as well so you adapted as you went along. What the B757 brought home to me was in reality how much of X-Plane under its new guise was really different and like anything else you had to adapt with the changes set for you. Overall the X-Plane11 dynamics are quite extraordinary in their feel and obviously very different. The Carenado Do 228 release was a blockbuster. These short-regional aircraft are always very versatile, but this one was very nice to fly as well. Now between the Beechcraft 1900D and the Dornier, you have a really have a hard desicion to make on which one is the one to fly, detailing is "open mouth" and can you actually believe "how good is this" territory, but it shows how good the add-ons now are for X-Plane. It was a very hard aircraft to move on from to do another review. I am a big fan of demographics, and so Laminar Research's X-Plane collected data which is published periodically is always going to interesting. But this last release was more shocking than you could reasonably expect. The main thought is that, who is just a casual user and who is the diehard user. Are most users just flying in X-Plane as another distraction like playing video games and watching You Tube, or are they really into X-Plane... X-Plane. I will always note that the core users will always be a lot smaller than the overall size of people that have purchased the X-Plane simulator and to a point the data points this out. Originally the core group was around 30,000 out of 300,000 registered users, so about 1 in 10. But back then simulator users were very divided in what simulation platform they used. The fence was very high between the Flight Simulator hot shots and the X-Plane twiddlers, in other words X-Plane users were and still are very much involved in the mechanics and creation of the X-Plane world, were as the FS groups preferred to buy and build their world in components or packages. To a point both worlds have now merged a lot, and over the last few years a huge amount of diehard FS/P3D users have sampled X-Plane but still went back to their original offerings, but with the release of X-Plane11 last year the few then became a torrent as the walls fell and X-Plane became their primary simulation platform. X-Plane users have finally embraced the add-on market as well, as product gets better and this has pleased both camps. But that Laminar Research data is very bewildering. For General Aviation flying then X-Plane11 is the place to be, but many or most airliner pilots they are staying in X-Plane10? Why... well most probably it is the cost of upgrading those expensive add-on airliners, as at an average of US$50-$70 it is certainly a large replacement investment. Another point is that large aircraft users are waiting for the aircraft to be fully upgraded to X-Plane11 before taking the plunge, but in reality that case is now mostly closed as if not all the aircraft are now X-Plane11 compliant. On the RAM front it seems you need far more X-Plane11 than 10. 2Gb of RAM today is ridiculous as is 4Gb and the minimum now should be 8Gb. X-Plane on average with everything running with a heavy textured aircraft, large payware airport and a few plugins in using RAM is around constantly 6Gb, just under the 8Gb margin, so 16Gb should be the norm to not let the artificial RAM takeaway too much performance. In VRAM which is not listed in the data, then that is the the most developing important item with X-Plane11. I am at this moment updating my VRAM card from which I thought was a very safe headroom of 4Gb to an 8Gb card, even a 6Gb will be out of date in a year or so. So yes X-Plane11 chews up graphic cards like a hungry cookie monster. The reasons are mostly in the far more heavy aircraft 4K textures and the sheer scale of payware scenery we can now access. Weather was always a graphic card killer and although you will now slide through light weather event, but come to a stormy weather event and your frame-rate goes south. Add in WorldTraffic, X-Enviro and a box full of plugins and you can see why the graphic card is bulging. I noticed through out of the year my rendering options sliders were slowly going backwards, textures was were the biggest slips that moved, but mostly overall all sliders slid a full notch down, so even with my rendering options adjusted well down I am STILL always on the 4Gb limit or just under it or mostly over it. "aahh the cookie monster..."
Biggest surprise in the LR data was that a quarter (23.4%) of X-Plane users still only use the mouse for flying aircraft. I will attribute this to the fact that most of these users fly on laptops, but seriously... mouse input? a quarter of you? I lasted I think seven minutes flying with my finger... I am moving on from that fact. No doubt the biggest barrier to X-Plane11 is simply cost. Not only the actual simulator (which in reality is the cheapest part), but the hardware and the cost of updating the payware aircraft is a cost to overcome. I feel your pain, but the sheer benefits of X-Plane11 certainly bear out the upgraded cost factors, Yes you can buy X-Plane11, still put in a 4gb graphic card (around US$200) and update the aircraft PASYG. At least you are upgraded and flying, go on treat yourself for Christmas... oh and go and buy yourself a cheap joystick as well. On the "What would I like for Christmas" angle then I won't certainly be getting it this year, but I can hopefully put it out there for 2018. There is no doubt that in 2017 the rate of excellent add-ons have been the best yet, as we will cover in my regular end of the year review. But there are some holes I would like filled. In aircraft it is a head shaking in disbelief that there is still no decent top quality B787 Dreamliner? Yes there are a few out there, but not a deep level sim version, and "God knows" even Boeing will have sorted allthe the problems out of the aircraft before X-Plane gets one? A -9 would be very nice thank you.. A great Boeing 744 deep sim would be nice as well, but by the time we get around to that release all B744's will be in the scrapyard, you hear that PMDG? In General Aviation I would like a nice Britten Norman Islander, a nice aircraft that somehow X-Plane forgot. Another I will get down on my knees moment is for Carenado to cross over their currently in development F-27, yes that Fokker F-27 Friendship, at least it does have a chance of making it into X-Plane. Oh and my cruise that I went on in the first week of November? Well I did trivia, pass the donkey, the samba dancing, name that tune (very good at that), cookery competition and won a chef's hat, bingo, zip lining over the top decks, disco dancing every night, got lost on an island beach and eat myself sick with all the free food, I needed a holiday after all of that.